Our outdoor patio is available for private and semi private events. We are able to cater to your needs! El Camino is a restaurant and bar concept by Mauricio Couturier, created to provide an exciting and memorable Mexican dining experience in a kitschy neighborhood atmosphere. Our menu reflects an authentic blend of recipes and food concepts of popular modern foods from Mexico. We strive to seasonally source as much as possible from local area farms and businesses in San Diego. 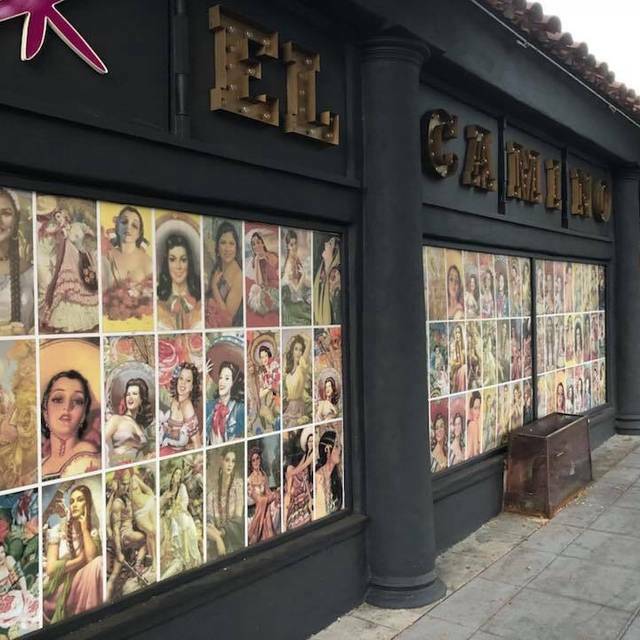 El Camino introduces a funky restaurant hangout to the Little Italy community that strives to be affordable, accessible, and addicting. Our house nachos topped with creamy kraft macaroni and cheese, baked with jalapenos and topped with bacon. Arriba! A glass bowl of fresh shrimp ceviche for a build it yourself tostadita! Served wth six corn tostadas and limes. Bueno for two people! At "el camino" our burritos are filled with homemade black bean spread, mixed cabbage, salsa fresca and wrapped in a grilled flour tortilla cut in half for sharing. Served with a side of our mexican street corn "esquite"
Three corn tortillas in a green tomatillo sauce. Topped with cheese, sour cream and cilantro. Stuffed with pulled chicken. Served with our homemade black beans and mexican rice. 4 flautas filled with sweet potato, fried and topped with queso fresco, cilantro cream and green tomatillo salsa. Que rico! 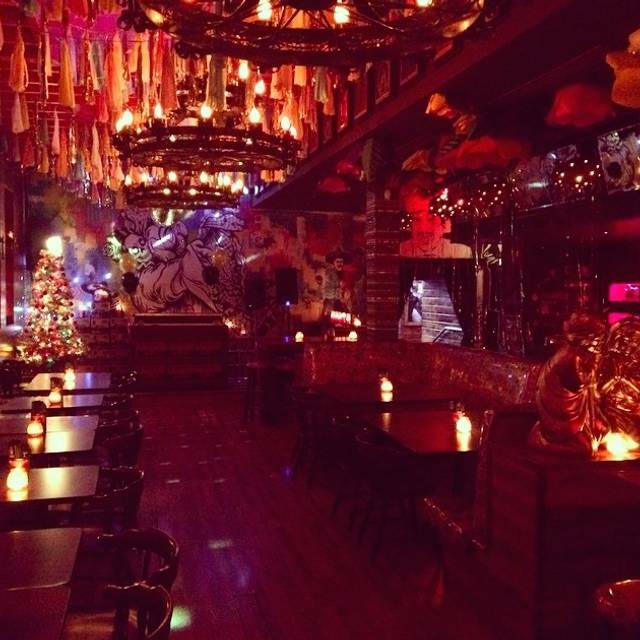 It is a cool Mexican cantina with great drinks and decor. Overall amazing! Host recommended some of the best drinks to start off and I took her recommendations. Our server Tory was amazing always checking what else I needed. Birthday. Was very fun and staff was nice, just need more waitressing especially for a big party of 15. Also did not know after 10pm there is a long line and had friends wait an hour in line. Overall very fun, food was good. Recommend for smaller parties. I love this place! My friends had never been there and they really enjoyed the ambience. They and I will be back soon! Favorite restaurant in Little Italy !!! Service was just okay and the music was loud for being somewhat empty. The decor inside was nice. The music was way way to loud. Impossible to talk. They were playing disco music which didn’t really go with the Mexican Food experience. The drinks were not good either. My date ordered a Paloma which tasted like watered down sprite with some orange flavor. I ordered a sangria which also tasted like watered down wine. Food was good, service very slow. Server felt very cold and bothered by request for salsa. Super cool environment, but it was cold in the patio. Not enough heaters. Squeezed a party of 9 onto one of their high tables. 4 of us had to sit on one side and it was very tight and uncomfortable. Wasn't impressed by food. Taco's were so so, not bad, just so so and guac didn't taste fresh. Not a horrible experience, but not fantastic either. Would return if invited, but wouldn't be my choice 2nd time around. We came here to celebrate my 25th birthday and it was incredible ! We sat in the outside area in our own private spot where it was a bit warmer. I love seeing the airplanes fly over! It was happy hour all night, and they had a taco Tuesday deal. The food was amazing ! I recommend the carne asada fries, and chicken tacos! For desert the fried ice cream was absolutely incredible. We got several pitchers of margaritas, and the sangria tasted so good (very cinnamony!) Our waitress checked in on us often and the guy who brought out the foot had about 6 plates he was able to carry and that was extremely impressive. All of the murals, and the Christmas lights really set the mood and it was an overall amazing experience. I’ll be returning again for sure! Great ambiance, Mexican food and service, what more could you ask for! The music was extremely loud with offensive lyrics. They messed up our food two times and it was not very good. I will never go back and I will not recommend this place ever. Fun ambience and atmosphere. Food was tasty. I had a skinny (flaca) margarita and it was overdone on ice and not much tequila or other ingredients- skimpy not skinny. I chose beer for my second drink instead. Fun atmosphere and easy going vibe. A little pricey but what do you expect, your in SD. Only thing I recommend is shots in happy hour menu 😉 love this place. I made a reservation and it was great ! Overall, food, drinks and everything else was amazing . Although the music was mediocre but still able to have great convos, dance and drink! Great spot but just noisy due to the planes flying over but if you get drunk enough you don’t even notice them. Lol. I was a little disappointed that our carafe of water broke on the bottom and spilled in mine and my daughters laps. They gave us towels but they could have given us something complimentary, like guacamole or something. Also, disappointed that they don't have regular salsa. The planes overheard was awesome and the decor is fantastic. We dined at El Camino before a show at the Casbah on an early Friday night. We were a bit late and the hostess graciously allowed us to move to a booth instead of a high boy bar stool table - I like to have backs on my chair to help my posture :). Since it was an early night, it was still happy hour and we ordered a pitcher of margaritas for the 4 of us for $25. They were very good and those who selected salted glasses got a treat - one half the glass was one type of salt and the other side was a different salt. Not sure what it was but it was tasty. The margs also had actual tequila in them and were quite good. We also ordered their housemade guacamole, which was delicious, and their regular chips came with a roasted salsa (picante), a queso type sauce, and a green avo/tomatillo tasting salsa. The best thing about this place is the decor - it is fabulous! Lots of Mexican Catholic mass candle pictures of saints, pinatas hanging, bright and festive upholstery, and just something to see everywhere. They had football on so I could see watching sports here. The Mujeres room was bright and festive too. The food was liked by all in my group of 5. I had a veggie quesadilla and it was very tasty with big chunks of vegetables, including corn kernels, mozzarella cheese (less fatty than jack or cheddar), my vegan friend had the sweet potato flautas, and all in all the food was good, but a little pricey, given San Diego's expansive Mexican food market. It was worth it because the experience was excellent, the service very attentive, and they helped us take home the extra food with a nice bag so we could take it into the Casbah venue with no problems. Also, for Casbah fans, we Lyfted to the restaurant, which is about 2 blocks from the Casbah, and then home from the Casbah as parking is difficult in Little Italy. A very nice experience and we will definitely be back! food was cold and very expensive ........................................................................................................................................ will not go back!! Servers did a great job despite it being really busy on a Friday night. Fun spot to start sunday funday day drinking. Bottomless mimosas and good for groups. The food was delicious, the staff was very friendly. The happy hour prices were great for the value. The only negative is if you sit on the patio planes fly overhead every few minutes, and it’s loud. I went here for my birthday. I brought in a large party (about 16).I made resevrtions before hand and they had a perfect table waiting for me. The service was outstanding! Very on top of orders and drinks. I would 100% recommend El Camino for any get together. Fun space. Had to negotiate with staff to move us to a bigger open table, not sure how they thought they’d serve 4 at the little table. Service was slow at closing out our check. I loved this spot. That is all. No complaints. I will be back! Went for Taco Tuesday. Three street tacos rice and beans - about 7-8 bucks. We ordered margs saw planes fly, people watched and lived our best lives. The host was chill and the waitress was on her job. I will take any visitors to this spot to look like a cool local for sure. Nice and fun place to eat and stay for the night life. This place is great! On Friday night the DJ plays old school hip hop and R&B. There for the is good and the drinks are decent. Sometimes they also have live music. El Camino works for just about anyone/any occasion except for a quiet, intimate dinner. I've been there for date night, with the Girls, for a birthday party, pre-show dinner with another couple and with my husband and two young kids. Each very positive experiences. My kids like the lucha libre action figures that come with the kids' meals. The food isn't great, but good enough (e.g. salad was overdressed, tortillas a little dry, shrimp in ceviche was fresh and plenty though). Drinks are good. Parking is not good at all so Uber if you can. But, combination of all EC has to offer makes it somewhere I highly recommend and will go back to. Great service! Great food! Great drinks! Friendly atmosphere! Arrived late, during last reservation of evening. Food was delicious. Guacamole was superb, potato and soyrizo crispy tacos were phenomenal, and skinny margarita pitcher was divine. Enjoy! Coworkers/friends celebrating 3 June birthdays and one work promotion/farewell. The server was very attentive and always checking on us. The day was beautiful, the music was great and the mimosas were on point. The food was delicious and I will continue to come here as they always make me count down the days to when I can come back! In town for business trip and El Camino was recommended by a friend. Excellent location for drinks and dinner. If you want to experience Little Italy in San Diego - this is the place. Planes flying overhead was an amazing bonus to the ambiance. Hostess was especially accommodating, held reservation for a few minutes because of delay with driver. Excellent choice for visitors or locals. Would definitely visit again! I had a wonderful time meeting up for dinner and drinks with friends. Everyone was friendly and helpful from the hostess to the waitress to the karaoke jockey. That’s right, they have karaoke on Tuesday nights. I can’t wait to come back!! I usually have a great time there.. it was my first time actually spending my birthDAY there. The ladies up front were really kind and welcoming. The downside was the waitress. Her attitude was not really welcoming. She wasn’t attentive to the table. She seemed as though she was ready to leave or not really like her job. There was absolutely nothing special about spending your birthday there so I wouldn’t recommend it for a birthday dinner but for drinking and dancing that about it. The food was alright. Went from being one of favorite restaurants to being kinda ehh about it.